It's taken awhile, but the second series of Lost figures are hitting shelves. I haven't seen these at any of the normal mass market stores yet (and Toys R Us did carry series 1, so I'm expecting to see them there), but LCS's have gotten them in. 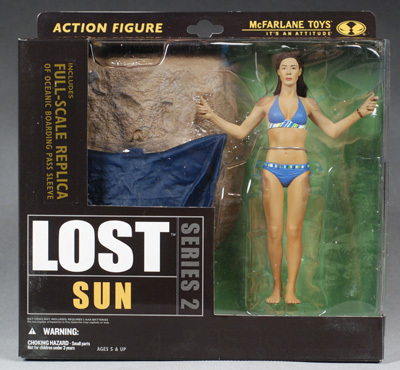 The second series includes Sun, Jin, Sawyer and Eko. As with the first series, each has lines from the show, as well as a full sized prop replica. These run around $15 each, depending on the retailer of course. Series 3 has been announced as Sayid, Desmond, Clare and Ben, but I haven't heard a date yet, and there wasn't anything on display at SDCC. Whether we end up seeing them or not is a question we won't get answered til next year. The packaging is new, redesigned since wave 1. The black appearance works for the license, and there's far more text this time around then usual. There's a nice listing of the phrases each figure says, with some additional personalization on the figure. This box style is a departure from the clamshell that we've seen with most Mcfarlane lines, but it works well. This isn't completely collector friendly though in the traditional definition. You won't have to literally destroy the package to get them out, but it's fairly unlikely that you'll want to go through the effort to put these back once they're free. Of these four, there's one very clear winner. Of the other three, which one you find least attractive is probably going to depend somewhat on taste. Eko is an excellent sculpt, on par with most of the first series. He does have a bit of a zombie look to the eyes, but that's a paint issue, not a sculpt issue. His pose is menacing yet not over dramatic, and the scale of the figure works well with the rest of the line. The hands are sculpted to look good with the stick, and his feet are spaced perfectly to fit on the pegs. Sun is likely to be one that most folks feel ambivalent about. It's reasonable accurate, and reasonably attractive, but the pose is a bit odd for any character, let alone Sun. Yes, it does match up with a very specific scene from the show, but it's not a very definitive look for the character. 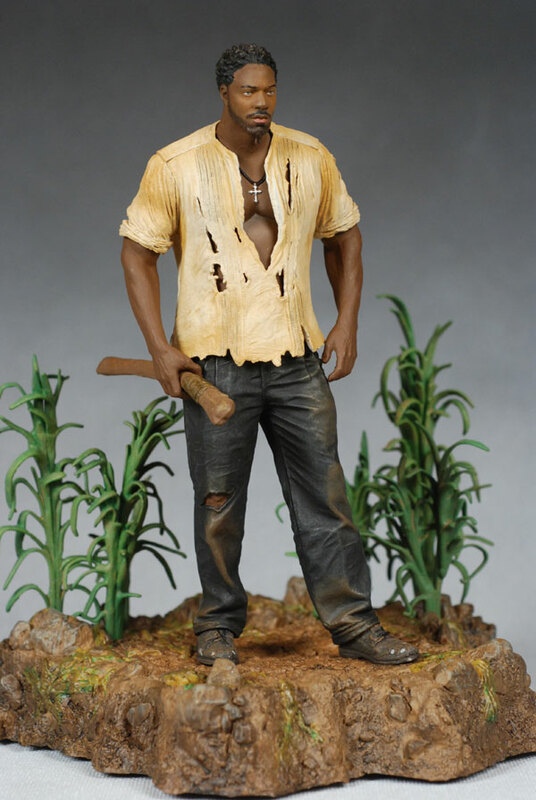 Compare it to the pose and appearance of Eko, and you'll see what I mean. Still, they managed to engineer the figure to work perfectly with the base and towel, and now you have two hot Lost chicks in bikinis for your display shelf. Jin is my least favorite, particularly in the sculpt category. This pose was based on when he had been captured by the tailies, and was trying to escape down the beach and warn the incoming Sawyer. The pose is one of those extreme ones, with dynamic movement in the clothing, hair and even expression. As is often the case with something this extreme, it misses the mark for me. Like Sun, I don't think of it as a particularly definitive appearance for Jin, and the extreme expression makes it more difficult to see the actual character in the sculpt. Sawyer will probably be the one that generates the most debate. 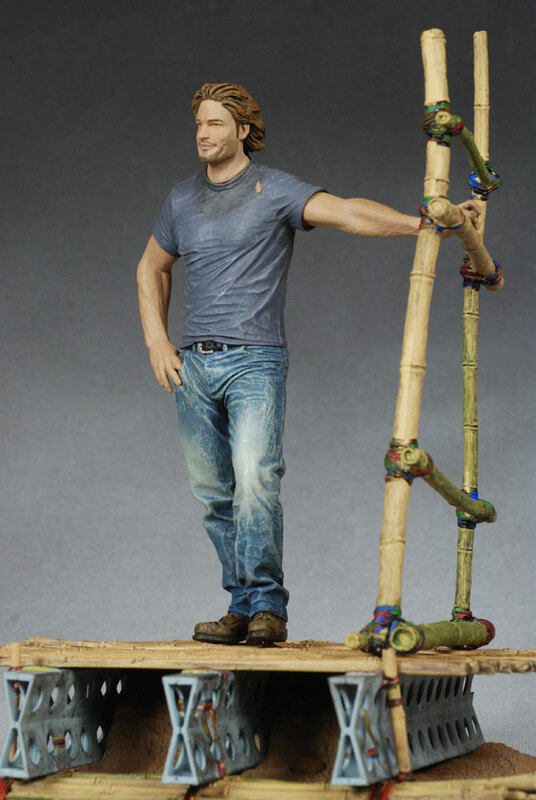 From the neck down, it's an excellent sculpt, and the relaxed pose on the raft harkens to a point in the show where he was probably the most at ease and in control. 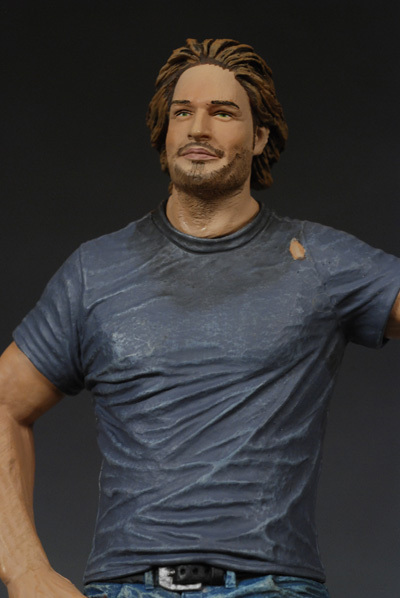 However, I suspect most folks will be disappointed in the sculpted expression, which is smiling and a bit more friendly than Sawyer usually looks. For me, it's less about the expression - which I can live with - and more about the actual face and hair sculpt. He has a huge forehead, and the hair looks more like it's plopped on his head than we usually see with a Mcfarlane product. There's also a bit of a deformation of the head and face, perhaps caused by the molding process. Eko almost scores another half star here, particularly because of the excellent work done on his shirt. The wear and tear is reflected even in the color, and they pulled off the slightly stained look much better than usual. But poor Eko has some zombified eyes, hurting the look of the otherwise excellent head sculpt. He comes across with a rather blank look, something that Eko never had. But if you can ignore that (or yours doesn't have that particular issue), I'm betting you'll be much more pleased with this figure than the rest. Sun and Jin are both good, but not outstanding. There's a little slop here and there, and the paint on both attributes to some weirdness in the eyes. Jin in particular has this weird lazy eye thing going on that adds to the difficulty in seeing the character under there. Sawyer was my least favorite this time around. To try to tone down the excessive forehead and weird hair, they added an additional painted on hair line. The color is off though (as is the general color of his hair), and the paint work further hurts the sculpt. 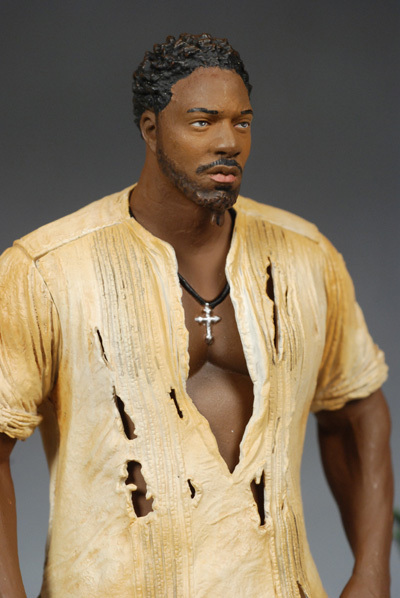 But similar to the last category, the work from the neck down is great, especially the worn appearance of his clothing. If you're looking for super poseable, look someplace else. These are plastic statues, with about as limited of articulation as you can have and not be completely solid. And in the case of Jin and Sun, completely solid is the story. Eko has cut arms at the sleeves. Sawyer has one cut arm as well, along with a cut neck. Sun and Jin have zero articulation. Even the most anti-articulation collector has to admit that's pretty limited. 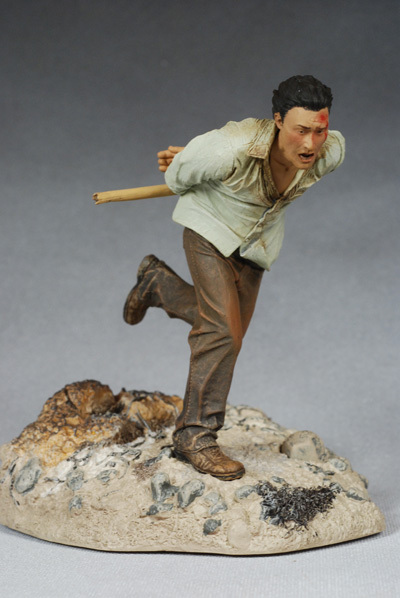 All four figures come with full scale prop replicas, along with the talking bases. The first series had separate talk boxes that attached to the back of the base behind the backdrop. Idiots (like me) had trouble figuring this out. It looks like they decided to help out us idiots by simply building the box into the base this time. The bases look great, although they lack the backdrops this time. I'm not sure why they moved away from those, and that's a little disappointing since it hurts the consistent appearance of the line. I suspect I'll go back and remove the backdrops from the first series (and skip those boxes) to keep them looking a bit more consistent together on the shelf. Sun has the more basic base, but she also has the towel that attaches to the top of her back and sticks out straight. It's made from a very hard plastic, and is unlikely to wilt over time. It also is well engineered, fitting the peg hole in her back tightly and also matching up with the outstretched hands perfectly. Jin's base looks fine, and he won't be falling off even in the extreme pose. The handcuff and stick aren't removable, but that's not really a surprise. Sawyer's base is the most complex, and also the most interesting. It's the raft that they used in their attempt to get off the island. Again, Sawyer fits on it extremely well, and this one is the most realistic in appearance. Eko has one additional accessory - his club. It is easily removable from his hand, but I did have some trouble with the paint pulling off right out of the package. It looks like either the club or the hand were still a bit tacky when it was put in place, and the paint stuck. Also, it does look like the symbols are sculpted into the end, but the brown paint is so thick that it pretty much hides it entirely. 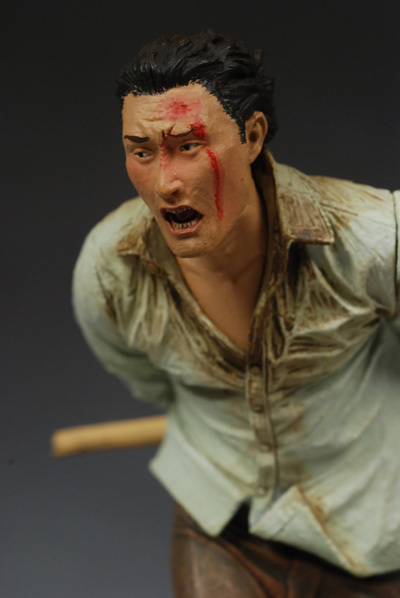 All four figures come with the full sized prop replicas, but once again, this is an idea that only works in limited cases. Eko's replicas are actually very cool - two small Dharma slides. These actual slides look great, and make a ton of sense. The next good prop is with Sun. She comes with the Oceanic Air ticket sleeve, sans the ticket or any luggage claim tags. It's another item that would actually garner some discussion if you leave it laying on your coffee table. Sawyer and Jin don't fair quite as well, although both props are at least very specific to them. 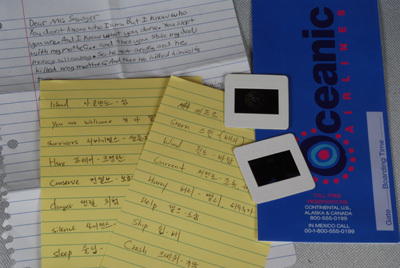 Jin comes with two very boring pages from his 'translation guide', done up on yellow ruled paper. That's one that's getting shoved in the accessory drawer. Sawyer does slightly better in theory, coming with the letter he wrote to the real Sawyer. Done on white ruled notebook paper, it looks pretty good, except for the fact that it's folded backwards (with the words on the outside, not the inside). While it sounds cool, it ends up being another fairly boring item, and lacks the realistic feel of the slides or the ticket folder. Eko: "I am Mr. Eko"; "And tell your friends I let you live. That Mr. Eko let you live. "; "I understand that you live in a world where righteousness and evil seem very far apart, but that is not the real world." Sawyer: "I'm a complex guy, sweetheart. "; "There are nicer ways to wake a man up, freckles. "; "There's a new sheriff in town boys, y'all just get used to it. "; "Fun time is over, Bongo. Why don't you go hit the buffet." Sun: "Have you never lied to a man you loved? "; "I was going to leave you...I was going to get away. "; "My wedding ring...it's gone! "; (and in Korean) "I'm not saying you should go alone. I'm coming with you." Jin "Others! Others! Others! Others! "; "I love you"; "Everything is going to change. "; (in Korean) "I can't talk to anyone. I can't understand them. I need you, Sun. "; (also in Korean) "Hurry!" I still have the same feelings toward the feature though. I'm not sure I see the value in these characters speaking, since this isn't a show that exploits one liners a whole lot. These aren't for kids, but then, what kids watch Lost? These aren't really action figures - they're pop culture collectibles, sort of like Hummel's for people under 40. Go in expecting that, and you'll be cool. The talking feature does make them a bit more fun for the older set too, although I'm not a huge fan. These are fairly expensive online, running around $15 at most stores. Unless we see these at a mass market store like Toys R Us, that's likely to be the price most folks pay, and that's at least $3 more than they really should be. Throwing in a piece of paper with these figures doesn't make up for the extra $3 or so that they're asking. Not much. Take some care when first moving the club in Eko's hand to reduce the chance of damaging the paint, and you should be fine. Eko is the easy winner this time around, while the other three are more on par with Jack or Kate from the first wave. They're okay, and the diehard fans will want them, but the casual fan won't be buying the full set. - Clark Toys has a great price on the set of four at $55. The singles are more normally priced at around $15 each. - Amazing Toyz has them at $15 or so depending on the character, and the set of four at $58. - Cornerstorecomics has them at around $15 each, or the set for $58. - Time and Space Toys has them at around $20 each. I reviewed series 1 in two reviews, with Shannon, Charlie and Kate in one and Locke, Jack and Hurley in the other.